Much of the growth of electronic commerce has been rooted in convenience – the Internet has made it easier to complete a wide range of tasks without leaving their desks. As our media consumption and shopping behaviours become more sophisticated, success will increasingly rely on the efficiency of online transaction processes. In the early years of Internet shopping, retailers could rely on the fact that customers were increasingly time-pressed to drive them to their websites. While many consumers turned to the web in the belief that the prices would be lower, there were many others for whom it is just an easier way to get things done. Having worked for brands with national distributions I was always struck by the higher than average proportions of consumers from commuter belts around large cities. It became clear that the web worked most for those with least time on their hands. People who spend 2-3 hours per day commuting have very little time in their lives for the ordinary things like buying that new fridge freezer, sorting out insurance or paying their motor tax. Now that nearly every self-respecting retailer is online and has an online order process, the goal posts have shifted – if anything they have moved further down the park and gotten smaller. For evermore time-pressed consumers retailers must also now meet their need to get the task completed in the shortest time with the least effort. Being efficient means “performing or functioning in the best possible manner with the least waste of time and effort” [ref]. For online customers this means getting the best possible result – the right product for me at the right price – with the smallest amount of effort. To see what this might mean in real terms let’s have a look at the world’s largest and best known online retailer, Amazon. Even though they don’t use the term efficiency, many of Amazon’s strategies have been absolutely focused on delivering efficiencies for their customers. Speed matters. Research studies from many large websites indicate that tenths of seconds in the download times of retail websites has an impact on customers’ likelihood to continue. As far back as 2007, Amazon discovered that with every 100 milliseconds increase in the load time of pages on their site sales decreased by 1%. A golden “one second rule” was introduced as a result with the imperative that no webpage should take longer than one second to download [ref]. We need to consider speed not as a technical problem but a business imperative. Technical factors such as server capacity and the complexity of the code will impact on the speed with which a webpage will render in a person’s browser. Google, for example, learned that by cutting its home page size from 100KB to 70-80KB, thereby decreasing upload time, Google Maps’ traffic went up 10% in the first week, and an additional 25% in the following three weeks. As business owners and managers these factors should be understood in order to ensure that download times are reduced to the point of insignificance. Today, the home page of Amazon.com does indeed load for me in less than 1 second. However the home page of one of Ireland’s largest online retailers took at least five times longer to render. Is that 40% of their customers lost already? Many factors go into any purchase decision; the product specifications, the price, how it compares to other similar products, what others say about it. Wouldn’t it be great if you could get everything you need to make your purchase decision in one place. Through the many e-commerce innovations that Amazon have introduced they have done just that, thus reducing the effort that their customers need to make to complete their task and building up incredible customer loyalty as a result. Customers want to find out about the product. Amazon do that of course on a product page by providing imagery, detailed product descriptions, excerpts and previews from inside of books they stock. Customers want to ensure that they are getting good value. Amazon do that by highlighting the RRP and showing their retail price together with the value of any discount. Amazon typically also highlights their free delivery option which is a significant decision-maker for online purchases. Perhaps the most compelling innovation in bringing value to customers is the Amazon Marketplace; where customers are presented with the same product available from others sellers through the Amazon site. Customers can choose both new and used alternatives, all at different prices. Amazon benefits by taking a share of the revenue, but their customers really benefit by being presented with the choice of a wide range of options in one place thus eliminating the need to cross-check with offerings on other websites. Increasingly, customers trust the views of others “just like me” more than what advertisers or product creators might say. Amazon have long offered other customers’ reviews and ratings and cleverly rank the reviews based on how helpful others find them. Amazon also highlight what other customers do on their website after viewing a particular product and what other similar products they buy – all helping to inform and support customers’ purchase decisions. There is very little that Amazon don’t do to help you make your decision, and they do all of this on just one webpage – now that’s incredibly efficient. Online retailers always bemoan the high level of exits on their checkout page. Customers make all the effort required to decide to purchase and then just before they commit their payment details they disappear in their droves. Now while customers often click through to the checkout just to verify the final final price, for many the process is just too unwieldy to bother. The final critical piece of efficiency is securing payment and delivery/billing details, and once again Amazon excels at this. We used to think that three clicks was an acceptable number for a customer to achieve a task online. 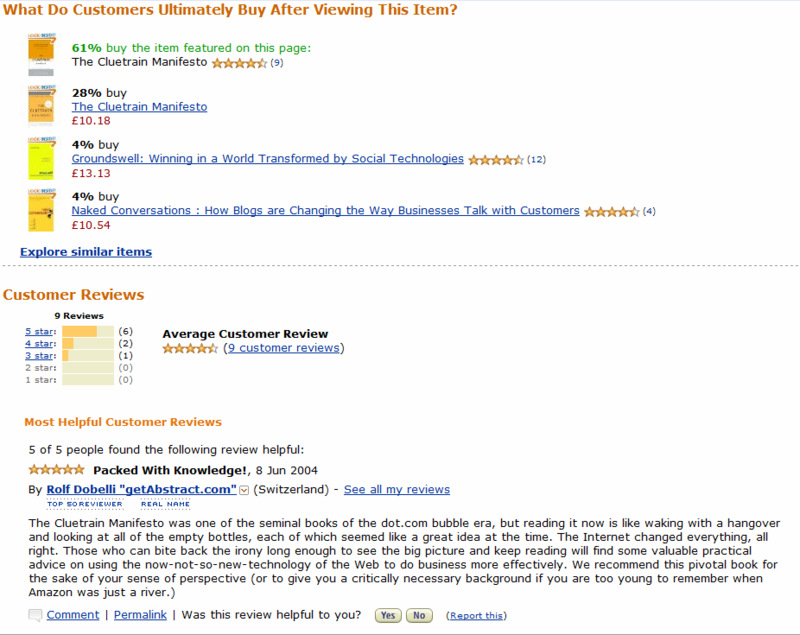 Amazon went two better and introduced “one click” buying, eliminating all of the typical barriers to purchase. Customers do need to be logged in to avail of this service of course, but Amazon remembers all your payment and delivery details. Furthermore, all one-click orders placed within a 30 minute period will be grouped together for payment and delivery where possible, thus further increasing the efficiency of the entire process. Amazon has recently announced a further simplification of the purchase process by providing an alternative to logging in. Clearly users to all websites often forget their passwords and no matter how simple the password retrieval process is, there will be a high exit rate at this point. The introduction of PayPhrase means that customers can now by-pass the sign-in process by using a 4-digit PIN coupled with a phrase of your choosing consisting of more than two words. Amazon has long been the standard-bearer for online retail. They have continued to respond to shifting customer expectations, in particular the shift from convenience to efficiency as a key success factor. In the middle of a downturn Amazon’s revenues continue to rise and the share price is at an all time high. It seems that it pays to give customers the efficiency that they want.